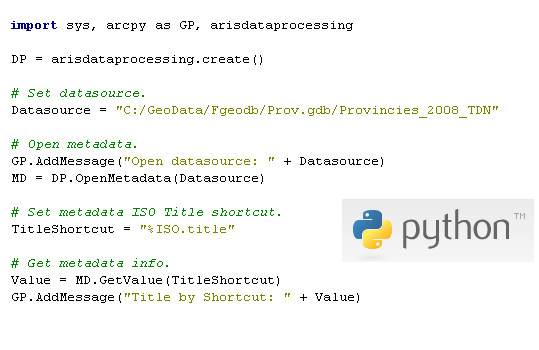 The DataProcessing Tool provides elementary functionality for working with metadata, layerfiles and mxd-files in ArcGIS or in a Python GUI/IDE like IDLE, PythonWin or PyScripter. Time consuming and complex management tasks can easily, efficiently and reproducibly be performed using Python scripts. The Netherlands Environmental Assessment Agency (Planbureau voor de Leefomgeving, PBL) manages a large quantity of data and related metadata inside an infrastructure based upon ESRI software and standards. However the existing solutions showed limitations when managing these data and metadata. The DataProcessing Tool was developed to simplify the management of data and metadata and to make it less time-consuming. The tool is a library of objects and functions, which can be used in Python scripts. 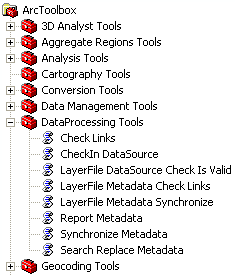 The tool is thus similar to the ArcGIS Geoprocessing automation library. Create metadata templates and layerfiles. Search/query layers in layerfiles and mxd-files. Search/query and edit/update layer properties, such as the data source. Search/query and edit/update DataFrame properties in mxd-files. The usage of basic objects of the DataProcessing Tool and Python scripts facilitates that time-consuming and complex management tasks are performed easily, efficiently and reproducibly from ArcMap or ArcCatalog. Searching and replacing of certain text in all metadata. Changing the paths of data sources in all layer files in a certain workspace. Exporting a selection of the metadata to a database. Shortcuts can be defined for frequently-used metadata features (the XML-tags). When subsequently querying or updating metadata these shortcuts can be used, instead of long and sometimes rather cryptical XML-tags. "The DataProcessing Tool gave the PBL a tool for efficient en flexible data and metadata management. The use of Python scripts gives the tool unlimited usage possiblities and makes it easy to add new management tasks." The win32com.client from the pywin32 package is required (https://github.com/mhammond/pywin32/releases). Be sure to download the proper pywin32 version according to your Python version. Please contact us if you have any other questions about the ARIS DataProcessing Tool. ARIS and the PBL have decided to make the DataProcessing Tool for ArcGIS 9.3 available for free to any other organisation. However it is not allowed to use or spread the free version tool in any commercial product. The DataProcessing Tool is released 'AS IS', without any warranty! The DataProcessing Tool for ArcGIS 10.0 and later are not publicly funded anymore, so these versions require a license fee. Interested? You can download an almost fully functional version, with a 5-day trial license for a specific ArcGIS version by clicking on the "Download setup" link or view the User's Manual in the table below. Note: The license for a specific 4.x version is valid for any 4.x version.